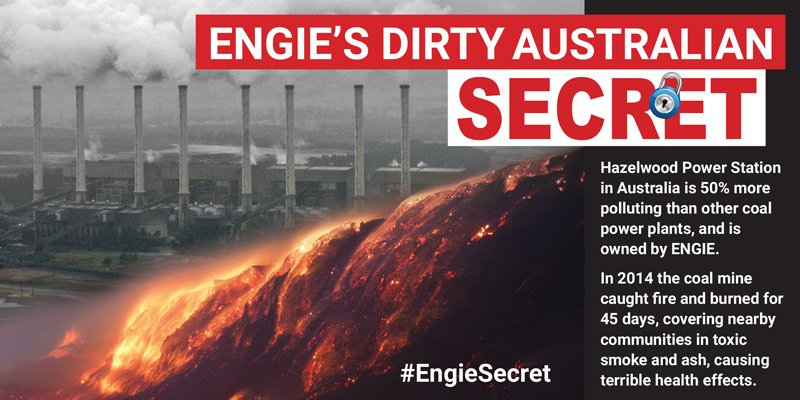 A live question was asked at the Engie Group General Assembly (AGM) in France about the Hazelwood Power station in the LaTrobe Valley of Australia, Engie's dirty secret. Engie say they will only generate low or no carbon electricity, but Hazelwood and plans to upgrade the turbines at Loy Yang B power station proves that this talk is just greenwashing. Engie needs to show corporate responsibility in settling the claim for costs for putting out the 45 day 2014 mine fire. They should be building renewables and planning the phased closure of Hazelwood and Loy Yang B power stations and rehabilitation of the coal mines. They need to consult and negotiate with the LaTrobe Valley and Morwell community about employment, energy and mine rehabilitation for a just transition. Engie, more widely kknown as GDF Suez, is a majority owner along with Japanese company Mitsui of two coal mines and power stations in Victoria. The subsidiary company, International Power, runs the Hazelwood and Loy Yang B power stations. Yet Engie has just announced that it hopes to spend ‘tens of millions’ of dollars to upgrade the turbines in the Loy Yang B power station. Why would a company that is serious about climate change be further investing in coal? It only locks in burning more dirty polluting coal. Will this become a stranded asset that will affect shareholder value? 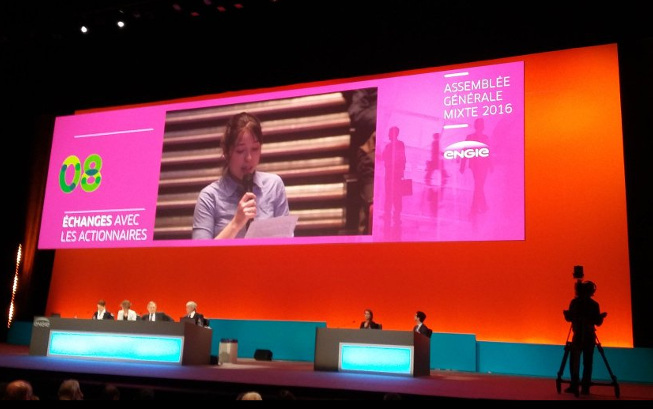 Engie was a sponsor of the UNFCCC climate talks in Paris. So how can Engie justify it's low carbon corporate image when it is investing millions of dollars into the continuation of coal mining and coal power in Australia? For consistency with the principles of the Paris Agreement and the objective of limiting the increase in global temperature below 1.5 ° C, Engie company, which the French state owns a 33%, shall: Close Hazelwood and ensure that workers receive all their rights, rehabilitate the mine and transform according to the community's wishes. A question was asked at the company general Assembly (AGM): Would not the ENGIEgroup "sense of history" necessitate the closure of Hazelwood? Engie sub-sidiary companies are facing 3 different court actions relating to the 2014 Hazelwood mine fire. Engie claimed the mine fire had directly cost the company $40 million, but legal action may vastly increase this. The State Government has also increased mine rehabilitation bonds. Existing bonds were increased to 50 per cent of the mine's self-assessed value by June 2016 and 100 per cent by January 2017. It appears this is just an initial step though as the Government said they were developing a more effective system to set future mine rehabilitation bonds. American technical services company AECOM estimated the cost of rehabilitation of the mines at a much higher cost. Their report outlined that conservative but realistic estimates of the liability cost of end of mine life was $266 million for Yallourn, $286 million for Hazelwood and $305 million for Loy Yang. The Victorian Government in the state budget also increased the mining royalties tax to bring the rate of payment in line with coal royalties in other states. The rate will increase three fold from January 1st 2017. New Engie Group CEO Isabelle Kocher described how the company is part of the new energy paradigm, and that the company will prioritise lowering CO2 emissions in three years to 2018. She articulated that Engie will stop all coal fired projects: that they are streamlining, reducing the current coal fired production facilities. All while in Australia their subsidiary companies are planning upgrades to Loy Yang B turbines to continue and lock in investment in assets for many years producing a high level of carbon and particulate pollution. Activists from Australia and France highlighted the discepancy and greenwashing by Engie on social media. In Australia the hashtag #EngieSecrets was trending for a while.